5Pointz, the Queens building known for more than 15 years as a mecca for graffiti art that was featured in films and music videos, was painted over during the night as the building faces demolition to make room for two apartment towers. The art "is gone," @5PointzNYC tweeted Tuesday. The building's owner, Jerry Wolkoff, told NBC 4 New York: "I know they're upset but it's over with." The 200,000-square-foot former factory building, which stands five stories and one block long, is covered in hundreds of murals. Wolkoff bought the building 40 years ago for $1 million and never did anything with it. In the 1990s, he was approached by a group that cleaned graffiti from city buildings and was asked if the vacant structure could be used as a safe place for graffiti artists to display their work. He agreed, and graffiti began to flourish there, eventually drawing attention from artists around the world. 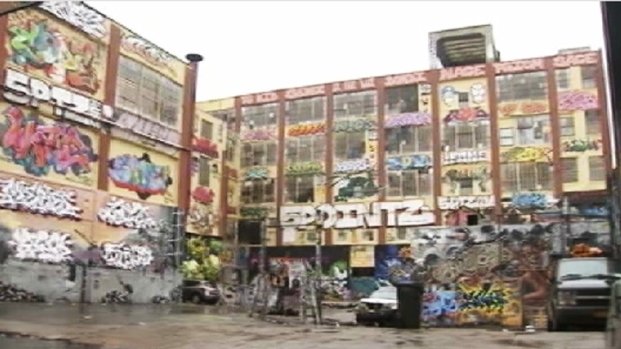 See video of the 5Pointz building before it was painted over. It has been featured in music videos, including Jadakiss' "Hold You Down," and films, like the recent "Now You See Me." But Wolkoff and his sons now aim to demolish the building and build two apartment towers that will house 1,000 rental units, 200 of them affordable housing. The plan has been approved by the City Council. Wolkoff told NBC 4 New York that he had the building painted over at about 3 a.m. Tuesday to avoid a daytime confrontation with artists and because he wanted to spare them the pain of seeing their paintings demolished bit by bit over time. The demolition, he said, will begin in January and could take as long as three months. "I can imagine going one piece, one piece, and going through hell, torture to everybody," he said. "So I said, 'Let me do it one time and end this torture one time.'" Marie Flageul, an artist with 5Pointz, was in tears at the building Tuesday, where artists showed up throughout the day, gazing in stunned silence at the new face of the structure. "My heart is broken," said Flageul. "What's ironic is we're supposed to be the vandals and we did everything by the book, and he's the biggest vandal of all. He disrespected everything we've done for this community in a lawful manner." Wolkoff likened the move to forcing a child to take medicine, and said he is surprised the artists are upset, pointing out that the new building will have a 60-foot wraparound wall for graffiti. "In the new building we're going to let them come back, and it's going to be similar and better," he said. "They're upset with me now but it's the right thing for both of us." A federal judge this month denied an effort by graffiti artists to stop the building from being destroyed. On Saturday, supporters rallied at the building in Long Island City to try and save it. Some New Yorkers who ride the 7 train lamented the whitewashing of the once-colorful building, which could be seen from the above-ground train in that part of Queens. "Going to miss seeing this from the 7 train!" Joshua Pondicanno commented on NBC New York's Facebook page. The building was "my fav thing to look at on my work commute," said Jess Freijo Vanderbilt. The Landmarks Preservation Commission said in August that 5Pointz didn't meet landmark status, clearing the way for the residential development.